Shannon Crandall, a Syracuse native and mixed media painter, will be exhibiting her work at the Canandaigua Art and Music Festival for the first time this July. We asked her to share a bit about herself and her work, and what festival goers can expect to see from her booth this year. Shannon tells us that she knew art was her calling as early as Kindergarten when she began finger painting. She tells how throughout her life she has loved to focus on creative pursuits like photography, cooking, painting, sewing, jewelry and “anything I could mold and make into my own creation.” Although she has taken some art classes in the past, she still considers herself to be largely self-taught. 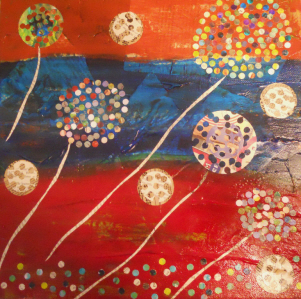 Now she has moved far beyond finger painting and focuses heavily on mixed media paintings that aim to capture the essence and experience of life. Susan describers herself as a mixed media artist who works intuitively, creating art from recycled paper, paint and texture mediums. She believes that the positive encouragement and feedback from friends, family, and patrons alike has helped her to grow as an artist. When asked about her art style, Shannon replies that her style is as diverse as her art reflects. She tries to capture many facets of life, and says that each of her experiences “will eventually be translated into a creation.” You can see these creations at the upcoming Canandaigua Art and Music Festival, where she will be selling her work. You can read more about Shannon and view her work at her website, and view the pieces available for purchase at her Etsy shop. Patrick J. O’Connor has been painting for 45 years. Be sure to stop by and see his unique and vibrant watercolor paintings. The exact moment I knew I wanted to be an artist was in the 5th grade when I was doing a project using clay. What inspired you to pursue your passion for art? I was inspired by a watercolor demonstration in downtown Ithaca, New York. I think my art grabs people. I think it puts you in a place and time that you have been before. And I think my watercolors separate me from other watercolorists. If you see one of my paintings along with 100 other paintings, you would be able to pick mine out without a signature on it. What feedback have you received from showcasing your work? What should attendees expect to see from you at this year’s Festival? People should expect top-quality work. What’s one thing that people may not already know about you? I would like people to know that I have been painting for 45 years to get to the point that I am currently at and I am 57 years old. That is a long time. Where/how can people purchase your work? You can purchase paintings at the “Patrick J. O’Connor” gallery at 231 West Water Street in Elmira, New York or online at www.pjogallery.com. The telephone number is 607-483-4640. 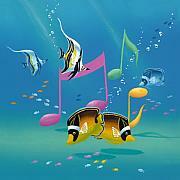 Kenneth Faunchman, a Fine Artist from Buford, GA, produces one-of-a-kind art that highlights aquatic sceneries. 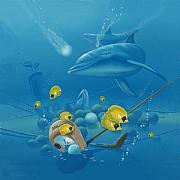 An oil-painter, Kenneth uses brush work to create nautical pieces, underwater scenes, tropical fish, and more. His work is different from other painters, in that his work is 3-Dimensional, and viewers must wear glasses to get the full effect of his creations. “It took me seven years to develop the idea of 3-D art,” said Kenneth, who receives rave reviews about the 3-D qualities in his work, beautiful turquoise colors, and concepts with underwater life. Kenneth has always been interested in fish and water, and rightfully so, as he grew up in a family full of fisherman from Nova Scotia. His wife, too, comes from a family of lobster fisherman. 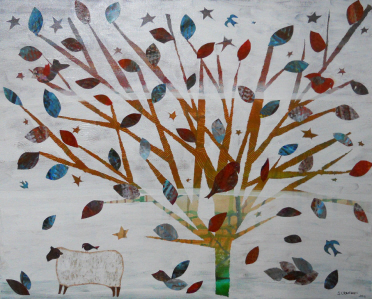 Inspired by both family histories, Kenneth’s artwork reflects his upbringing and early history. “All of my paintings have water in them, including lakes and ocean scenes,” he said. 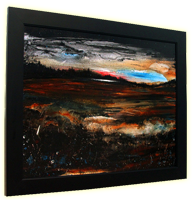 Kenneth’s work is sold and distributed throughout the country, as well as internationally for the past 28 years. Sold throughout the United States, Germany, Japan, Guam, and England, Kenneth has had his work featured in numerous galleries and museums. For more information about Kenneth and his 3-D work, visit his Web site, http://fineartamerica.com/profiles/kenneth-f-aunchman.html, and visit his booth at this year’s Canandaigua Art and Music Festival, Friday, June 16th through Sunday, June 18th. 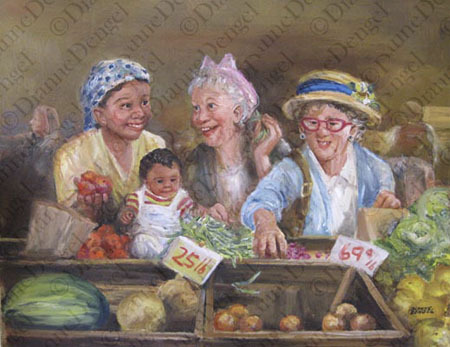 Dianne Dengel’s Mother noticed Dianne’s artistic talent when she was only three years old. Her mother worked at Edwards Department Store and, although the family had little money, she encouraged her daughter’s love of drawing people by bringing home the cardboard from shirt boxes that would have been discarded. “I had two college scholarships, but in those days, they expected all artists to be teachers. I wanted to be an artist. So I opened a tiny shop on South Avenue where I drew portraits for $1.50. I have no idea how I made ends meet,” she laughs. Dianne’s break came in 1984 when TV personality Mr. Rogers came to Rochester to do a show about Dianne and her work. 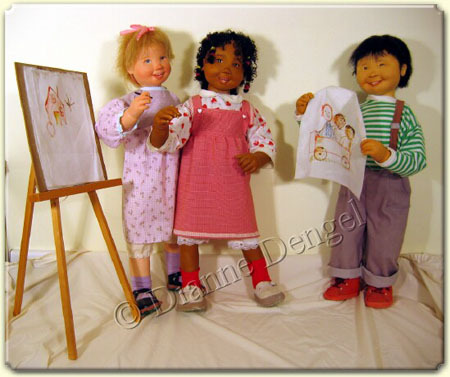 Each year, he rebroadcast the show, which brought Dianne recognition and orders for her one-of-a-kind paintings, portraits and dolls. 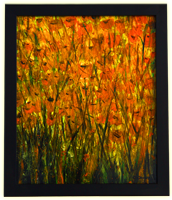 Her works are favored pieces in many private collections, including that of Oprah Winfrey. “I’ve been an artist for 52 years, and hope to keep creating for many more years,” shared Dianne. Dianne is known for her whimsical, loveable characters, so full of life and joy. You can watch Dianne work at her booth at the Downtown Canandaigua Art & Music Festival where you’ll also also be able view and purchase her paintings and dolls. Photos courtesy of Dianne Dengel.